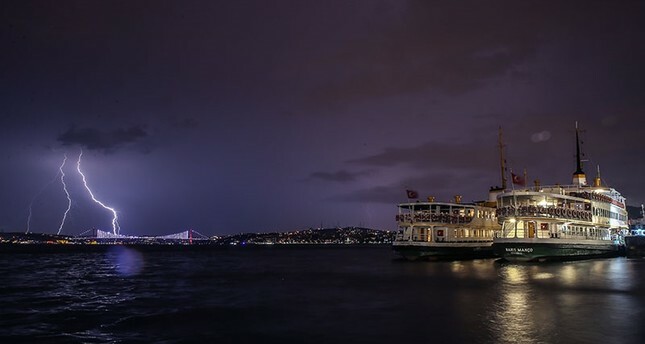 Thunderstorms swept Istanbul, Edirne, Tekirdağ and Kocaeli late Monday and in the early hours of Tuesday morning and are forecasted to continue until evening, according to the Meteorology Regional Directorate. In the Marmara region where those cities are located, as of 9 a.m., 43,388 lightning strikes were recorded in the past 24 hours,, in what meteorologists refer to as an "electric storm." Residents, especially drivers, are warned to be aware of possible flash floods, hail, severe winds and, most certainly, lightning. Spotted thunderstorms are forecasted for Wednesday morning, as well. Many Istanbul residents were awoken early Tuesday by rolling thunder and nearly constant flashes of lightning. Some rushed to capture images and videos of the lightning illuminating the skies while others expressed their panic on social media. In Tekirdağ, especially in the Çerkezköy and Çorlu districts, roads have turned to rivers due to heavy rainfall. In some areas, firefighters are working to clear water from floods that is overflowing manholes. Heavy rainfall also led to disruptions in air traffic. Four airplanes were diverted to other airfields from Atatürk International Airport, Istanbul's main airport, while a few other flights were delayed. Ahmet Köse, vice president of an association of meteorology engineers, linked the unprecedented storm to global warming and climate change. "Just like the increase in floods and drought, the number of such storms will increase and this will not be the last storm the region goes through," he told Anadolu Agency (AA), warning that the scale of storms might also expand. Istanbul saw an average of 4.3 days of rainfall every July between 1981 and 2010, but this will double this July, with a forecast of more heavy rains in the following days, Köse said. "Spring and summer are the most fertile periods of the year for thunderstorms as the warm temperatures create warm air rising into the atmosphere causing thunderstorms. Cumulonimbus clouds as thick as 12 kilometers are the cause of thunder and lightning storms," he added. Along with climate change, studies tie the increase in the number of electromagnetic fields to the rising rate of thunders and lightning around the world, Köse said, adding that 5G communications technology contributes to creating more electromagnetic fields. He also urged the public to heed the warnings by authorities for protection from lightning strikes. "The best way for protection is to stay indoors. People should also stay away from places with lightning risk, such as trees, flag or utility poles and install protective equipment against lightning strikes on the roofs of high-rise buildings. If you are outdoors, kneel down and keep your feet close together instead of lying down," he warned. Experts also caution the public to unplug electrical devices from power outlets during thunderstorms.